A fashion week is a fashion industry event, lasting approximately one week, which allows fashion designers and brands to display their latest collections. During the runway shows, buyers, celebrities, guests, and the media review the latest offerings from various designers. Fashion Week is an excellent resource for scouting out the latest trends. These events help the apparel industry and consumers know what's hot and what's not. Retail buyers attend the events as a preview for making purchases. Celebrities attend the runway shows to gaze upon couture designs and to be seen by the media. Below you will find access to numerous international fashion week events. View the second page of our Fashion Week guide for more resources. Fashion Week events run approximately six months ahead of time, so shows presented in the fall feature clothes for the next spring, and clothes shown in the spring are to be worn in the fall. When the haute couture industry first started in the 1850′s, it was exclusive and for the most part secretive to some extent. The top designers of the time held fashion shows in their ateliers specifically for their most prized clients. As fashion week events became common place in the apparel industry they were primarily attended by buyers for major department stores and high end specialty boutiques. Utilizing models, stylists and set coordinators, fashion designers were able to develop fascinating presentations to intrigue and inspire the retail buyers to select their garments for their stores. Don't forget to check out our new Fashion Week Designers section. 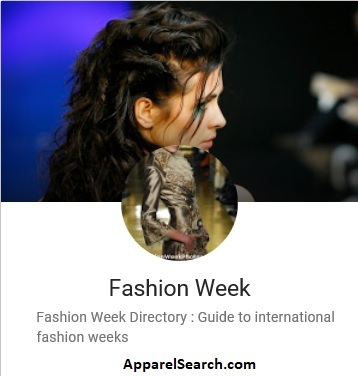 Also, if you have spare time, you may want to check out our new sites at Fashion Week Photos and Fashion Week Videos. As years past, fashion critics and a-list celebrities attending events. The general public became part of the action by viewing photos in the most popular magazines and newspapers. Since the birth of the internet, the world has full access to fashion week events via photos, live interviews, and videos. It would be a good idea to also check the Fashion Events calendar at the Fashion Industry Network and the Fashion Week Directory website to learn more. Learn about this years important fashion weeks from our fashion week events list. Thank you for using the Apparel Search website to learn about this special aspect of the clothing industry.